This tutorial is NOT a real mod that you could place in the mods folder, this is just a tutorial on how to change your files and is only meant for singleplayer games, it should also work on servers but I didn't test that, so always make sure that you save your original files first before going on! 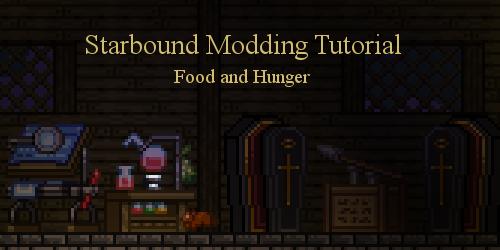 I have the Gog.com version of Starbound, there are mods out for the Steam-version, so you might want to search for those first instead of modding the game yourself. However, if the mods don't fit your needs or you are using the Gog-version, this tutorial works for both. Open the command console as administrator (for Win10 just type cmd in the taskbar-search and it shows up, right click on it and chose "open as administrator"). Note: It should also work if you open cmd not as administrator, but I always do it this way just to be on the safe side. Next you need 3 paths, the command console is working with dos-commands and you need to type in all the things you want to do here in old-school-style :D. So you should open up your notepad and type it in there until we are finished with this step. Don't forget to add those quotation marks like in my example! and the last path you need is where you want to store the unpacked files, in my example I create a folder named StarboundUnpacked on my E-harddiscdrive (E:\StarboundUnpacked). Copy everything and fill it into the open command window, Win10 with rightclick, other windows either with ctrl-v or right click and choose paste. Hit enter and wait a few minutes until the Dos-prompt shows again. Step 1 - prepare the food for eternity (or at least let it last a bit longer). change this number to 54000 if you want your food to stay fresh forever (well, forever is in this case 15 hours, instead of 10800 seconds = 3 hours). Note: 54000 is the highest number you can use (measured in full hours) before you'll get an error that leads to show the food with a 999999 in front of it's description. If you want your food to hold for let's say 5 hours put in the number 18000 instead... remember -> 1 hour = 3600 (seconds). Leave alone all the other numbers, they are fine and your food is now only rotting in the last hour/minutes. This is simple math, originally you'll lose 70 food over 20 minutes, the formula for this is 70:(20x60), simple as that. For those math professionals that wonder what the hell I just wrote: 20 minutes x 60 is 1200 seconds, 70 food divided by 1200 seconds is that original result/number in the file (-0.0583). "casual" : "hunger" : false"
All you have to do now is pack everything back and for this you'll need again 3 paths, but a bit different ones this time. NOTE: The file we will pack now must be a name that doesn't exist yet, in my case I will name it newpacked.pak. Copy all three paths into the command console now, just like you did when unpacking, hit enter and wait until it finishes and the Dos-Prompt will show up again, this can take a few minutes. That's it, now all you have to do is start the game and have fun.